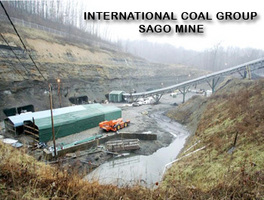 1 The miners who worked at the Sago Mine in West Virginia were coming back to work. They had enjoyed the New Year's Day holiday with their families, but now it was time to go back down into the mines and earn a living. It was hard work and a dangerous job, but their families, like many others in the state, depended on jobs in the mine for income to support their families. 6 They knew that the biggest danger in a mine came from mine gases - carbon monoxide and methane that builds up inside the mine. It would only take one spark to cause the gases to explode. 9 Thirteen others were trapped far below the earth in the darkness and swirling dust of the mine after the explosion.